Advanced, modern digital dual channel TENS and EMS unit. 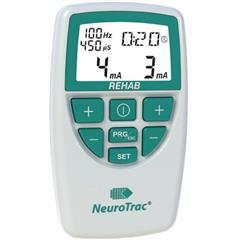 TENS and EMS treatment modes provide maximum flexibility for pain relief, muscle strengthening and rehabilitation. Dual channel digital TENS device for pain relief. 11 pre-set TENS programmers for easy of use: continuous burst, frequency/pulse. 3 customisable programmes with ability to set up your own high or low frequency continuous or modulated TENS treatment.